I've only recently learned about Au Pays de la Fleur d'Oranger, although the company has been around since 1998. Its founders, Virginie and Antoine Roux, take inspiration from their family's Grasse background and longtime associations with the region's perfume industry. As you can guess from their name, Au Pays de la Fleur d'Oranger incorporates the floral note of the orange blossom1 into many of its products. The three fragrances in its Neroli Blanc collection are all very pleasing, and they showcase this note in three different ways. Neroli Blanc Eau de Cologne is a "refreshing" take on orange blossom, and it's the most gender-neutral of the three compositions. It has top notes of grapefruit, bergamot and orange blossom; heart notes of rose, jasmine and tea; and a base of woody notes, musk and sweet notes. The orange blossom is surrounded by green leaves and freshly snapped stems, and there's a soapy-clean note in the heart and some very sheer, crisp musk in the base. Despite its feeling of fresh air and sunlight, this Eau de Cologne has surprisingly good staying power. Neroli Blanc Eau de Parfum, the "charming" character in the Neroli Blanc trio, includes top notes of orange blossom, lemon leaf and bergamot; heart notes of jasmine, rose, geranium, apricot and peach; and a base of caramel and benzoin. The orange blossom is headier here, with a dusting of sticky pollen. (It reminds me of the central note in Lush's Orange Blossom fragrance.) As the fragrance develops, the orange blossom is complemented by a slightly indolic jasmine and a honeyed peach note. Despite these potentially sweet notes, Neroli Blanc Eau de Parfum doesn't feel heavy, and it could be worn by men who aren't afraid of a floral note or two. Last but not least, Neroli Blanc Intense Eau de Parfum is a "rich" fragrance with top notes of orange blossom, bergamot and mandarin; heart notes of jasmine, rose and fruits; and a base of cedar, vanilla, musk and sandalwood. I'd call it a "fleurmand" take on orange blossom, since it adds some velvety rose and creamy vanilla. This is definitely the most perfume-y fragrance of the three, and the most feminine; naturally, it's the one I like the most. It also has excellent longevity. Just for reference, my favorite orange blossom fragrances to date are Hermes 24, Faubourg (so elegant!) and L'Artisan Parfumeur Séville à l'Aube. I can see Neroli Blanc Intense Eau de Parfum joining that list, although you could argue that it's not strictly an orange blossom scent; in any case, I enjoyed this trio and its varied interpretations of the company's namesake flower. 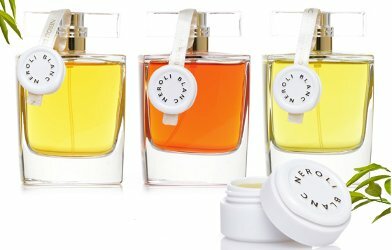 Au Pays de la Fleur d'Oranger Neroli Blanc Eau de Cologne ($62 for 50 ml, $85 for 100 ml), Eau de Parfum ($67 for 50 ml, $95 for 100 ml) and Intense Eau de Parfum ($67 for 50 ml, $95 for 100 ml) are available through Beautyhabit. For additional information, visit the Au Pays de la Fleur d'Oranger website. 1. See neroli in the glossary for a brief explanation of the relationship between orange blossom and neroli. All three of these sounds amazing! I’m like you, Jessica. I think from your description, the intense version would be my pick. I love orange blossom fragrances……Jo Malone’s Orange Blossom being one of my faves. Is BeautyHabit the only place it can be purchased right now? I’m a little old-fashioned and leary about buying fragrances “blind”. I want to be able to go to my local NM and spray it on, walk around a bit to see how it settles on me before making a commitment. Oh, and I think the bottles are so classy! Love it. I think BH makes samples available! Ys, I just checked; they’ll make up 3 samples of your choosing for $15. Not terrible, in my opinion. I haven’t seen the bottles in person yet, but they do look nice and simple (and attractive) in the photos! MiN sells some other fragrances from this company, but not the Neroli Blanc line, at least not on their website. You could order from the company website, but that would be international shipping…and no samples there. Maybe this brand will eventually be distributed more widely? I like Jo Malone’s Orange Blossom shower gel…so bright and refreshing! I agree, pretty bottles. Orange blossom has a tendency to go very Dove-soap on me, so it’s not a favored note (and I don’t really do traditional cologne, it bores me to tears) – but I do really enjoy Kilian’s Sweet Redemption and Seville a l’aube. You certainly wouldn’t like the Neroli Blanc Eau de Cologne, then — the soapiness is pretty pronounced! — but you might enjoy the Eau de Parfum. Sweet Redemption is a nice one, Seville, I didn’t care for or the Jo Malone. I do love orange blossom as long as it doesn’t get too soapy, i.e. Tauer. I still can’t figure out why I disliked Sweet Redemption so much! I like many of A Tauer’s fragrances, although I usually prefer them on other people, rather than myself. Houbigant’s Oranger en Fleurs is the lovliest Orange blossom I’ve found to date. Oh, that’s a really nice one, too. I really enjoyed my sample of it. What is that little jar on the right side of the picture? There appears to be one attached to each bottle. If that’s a solid perfume that’s a nice bonus. Hi, Jonas — the little jar is the solid version of the Intense Eau de Parfum. I haven’t tried it, so I don’t know whether it differs at all from the liquid Intense. I think the white circle attached to each bottle is just a button-like logo, similar to a seal. It’s cool-looking, anyway! I don’t know how I forgot to mention Serge!! Shame on me. PM Perfumes has an interesting one, Carissa, I think? Not sure if I liked it but it’s worth trying again maybe. It’s orange blossom + rose. I should try a few fragrances from that line! The violet one sounds good to me. The violet one is very good on the opening, imo, but the apricot is really big and I forget almost that it is a violet scent. His openings are pretty good but a few middle notes and many basenotes seem a bit messy or undefined. Just imo. They just seem to get lost after the openings on some, could just be me though. Interesting… thank you for the info! Thanks for the great review. I want to try them all! MMjunkie, I hope you’ll have the chance to try them! I found the orange flower notes very refreshing and enlivening on a cold winter day. I discovered the line at Sens Uniq in Paris a few months ago. Picked up Lavande Ombree which I totally adored. Oh, I am envious of your shopping trip! I have a sample of the Lavande, which I should try soon.